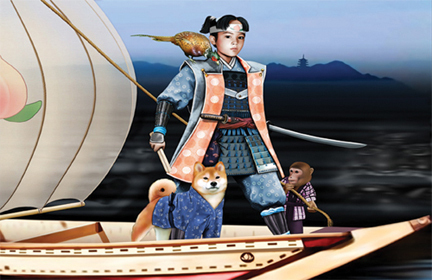 "The Adventure of Momotaro" is a well-known and very popular Japanese folk tale. The story is of a young man who is sent from heaven to be a son to an elderly couple. They, and the whole village are terrorized by the Oni, the demons from Onigashima Island. On his way to fight the Oni, Momotaro befriends a few animals, and together they reclaim all that was stolen. The show was developed with the support of JASMIS - the Japan-America Society of Mississippi. The grants from the Mississippi Arts Commission are available. Call us at 601-956-3414 or e-mail to peter@mspuppetry.com for more information.